Over the last few months I’ve received an overwhelming number of comments and emails about the hijab and wearing of a hijab. In particular, many of you want to know if it’s offensive for non-Muslim women to wear a hijab. The simple answer? Nope! Not even a tiny bit. If anyone tells you otherwise, tell them to Contact Me so that I can tell them how ridiculous they’re being. Before going on, you might be interested in reading about why Muslim women wear a hijab, or weird things I do with my hijab that you haven’t thought about. You’ll see on my post Questions About Wearing Hijab That You’re Too Embarrassed to Ask, many women are interested in wearing hijabs for lots of different reasons. I think it’s incredibly sweet that so many women are concerned about offending others with their actions. It’s lovely to be so thoughtful and we should all be mindful of how our actions will impact on others. There are really two concerns that have been raised and it might just be easier if I address them one at a time. Some women ask about wearing a hijab for modesty purposes. Although in the modern world, covering your hair is seen as an Islamic act, women have been doing it long before Muslim women came along. It shouldn’t be a thing that only Muslim women have a right to do. It really should just be an open act and no one has the right to attribute it to one group. Different people have different levels of modesty. That’s not to say that any one way of dressing is the ‘correct’ or ‘incorrect’ way. I think it’s so important that women feel comfortable, no matter how they’re dressed. If you’re more comfortable with a scarf wrapped around your head – then wrap that scarf up! Don’t let anyone try and define the rest of your identity with that. Plus, most things we do day-to-day that are ‘Islamic’! Eating. Resting. General hygiene. All the things… almost. This seems to be a big one. A lot of women who want to try on a hijab want to do so in their own personal social experiment. They want to know what it feels like to have such a huge part of your identity – your Islamness – being identified instantly. They want to know if people will stare at them or treat them differently. They want to know how wearing a hijab will influence their life. Some people, both Muslim and non-Muslim, think that this is an incredibly shallow way of looking at the world. Their idea is that spending a day or a week or a year ‘experiencing’ what a Muslim woman deals with day to day does not actually reflect the true experience. In being able to disconnect from any negative experiences by simply removing the hijab, it is believed that this experience does nothing to help Muslim women, going so far as to say that it is de-legitimising the concerns of the Islamic community. You can watch some women trying on a hijab here. Sure – in wearing a hijab for a day or two, you’re not going to understand what it feels like to have grown up in a world that tells you that you’re a no-good and you’ll probably never quite get how much effort it takes to convince yourself that you’re a good person. You don’t have to. That’s not on you to figure out. While wearing a hijab and experiencing what it feels like, even for a moment – many things may cross your mind. You might realise that you make look very different, but you’ll still feel like you. You’ll realise how much your looks play into your identity. If you walk out and about, you’ll realise that Muslim women are probably really aware of all the double-takes that people may make during the day. If you spend enough time in a hijab, you’ll realise that most women forget that they’re even wearing it, and it’s probably not a huge deal. Those experiences and feelings are excellent. They completely legitimise our experience and demonstrate to someone, who isn’t emotionally invested, what it feels like to be judged for a decision one makes about whether or not to cover their body. Now that is incredibly powerful. So whether you want to wear a hijab for reasons of modesty or because you want to empathise with your hijabi sisters – go for it. There is nothing offensive about it. Previous Rita Panahi – calling for debate without understanding the debate (or basic math). That’s a very sweet thing to do. Well done, you! Good luck. I hope it goes well. I’m so glad someone else has already asked this so I can benefit from the answer. I want to wear a hijab because I think it might give me some clue about how it feels not to be clothed in and protected by my impenetrable white privilege. Yes thank you so much sister. Last year I wanted to try on a hijab because I adore them and it makes women look so beautiful and modest but I was really nervous so I asked my Syrian friend and she said go for it. She said she chooses to wear it so if I choose to wear it then so be it. When I tell you I felt so good and beautiful wearing that hijab!! But now I’m near close minded people and when they see me wear it, they question me and tell me to take it off. Now I stand up for myself. It’s my head, I can do whatever I please. I still wear it to this day, whether I have a bad hair day so just because I want to! Power to you! Absolutely – you should do whatever makes you most comfortable! It does feel nice to wear hijab. one thing you did not consider are Iranian and other women being forced to wear hijab, google Stealthy freedom. Also there was an article written in Washington Post by an Asra Q. Nomani (a former Wall Street Journal reporter and the author of “Standing Alone: An American Woman’s Struggle for the Soul of Islam). and Hala Arafa (retired journalist and news editor at the Arabic branch of the Voice of America). on why they as Muslim women ask that you not wear hijab in name of solidarity. I believe we as women do need to support each other and like everything there are always two sides to every story just because we do not agree does not mean that either are wrong its just difference of opinion but I do believe that as much as we still need to support those who chose to wear hijab we need to also remember and speak up for those facing physical abuse, and jail because they fight for a right not to wear it. Hi there – you’re right, and a lot of women who wear the hijab are also supportive of women who want to escape it. I need to wear a burka, because I am unable to attain an appointment with my unreasonable ob/gynecology and in addition to diagnosed, fibroid tumors being left unchecked for at least 2 years, menopause has ravaged my femininity lowering the tone of my voice, acute hirsutism, and body parts that seemed to go bad overnight. I’m 55 years old and consider my life over. I try to stay in my house as much as possible, and I have plenty of work to keep me busy around the house. It is becoming necessary for me to have to interact more with people, still a minimal amount, but when I have to leave home, I want my head and face covered. I also suffer from bipolar depression but it doesn’t keep me from being an integral part of the non profit my daughter and I run. I would just as soon not go out in public, but the workload has made important for me to take up some of the slack for my daughter, who is, by the way, an angel; you can ask anyone. I am so sorry to hear about your experiences and hope that you are able to get the medical attention that you need. I understand where you are coming from and hope that you are able to find a way to remain connected with wider society. That’s great if it’s through a niqab. Having grown up hairy because of my PCOS, I understand how hirsutism can effect ones life. However, talking it through with people who had experience in helping such women, I was able to see that it doesn’t define who I am and I’m feeling a lot more comfortable with it. Thank God for laser hair removal! I’m so glad that you and your daughter have a great relationship. Best wishes to the both of you. I am only 12 and I want to wear a hijab but I am scared that I will be hurt because my friends are telling me that I could get hurt. I want to know what it is like to wear a hijab and I want to know what Muslim women have to go through. I am just a bit scared because there are a few Trump supporters at my school. What would you do? Thank you for your message. I started wearing the hijab at about 11. 9/11 had just happened a few years before that and I was pretty scared. However, I can’t recall ever being bullied at my school in those first few years for wearing the hijab. I, luckily, was at a very multicultural school where there were other girls in hijab. I can’t imagine being in your position at the moment. I am watching what Trump is doing, and I am worried – and I am in Australia! I think the best thing that you should do to make your decision is talk to teachers that you trust and see what they think. Please make sure you feel safe and, if you can, keep your parents informed about how you feel. I am so happy that I came across this page. For years I have been attracted to the hijab and always wanted to wear one but never did in fear of being disrespectful. Once learning the symbolism behind the hijab I felt even more inclined to wear one of my own. I did a quick Google search before committing to the idea because, again, the absolute last thing I want to do is offend someone’s religious beliefs, and I came across your page. You have given me the courage I needed to make the decision to wear a hijab. Thank you! So glad that I could help. Have you tried out the hijab yet? How did you go? I’ve been wanting to elegantly cover thinning hair (due to long term immunosuppressant medications) and have quick simple way to protect face and throat from sun exposure to which causes autoimmune flares. I’ve been buying pashminas and scarves and wearing with hair tucked up in a turban. The hijab’s loose flowing style is really appealing, but I was afraid it would look as though I was misappropriating a culture. Thanks to this article, this older, white, atheist woman will start experimenting. Will certainly be good to quickly pull end of scarf over my face to block the sun. I am sorry to hear about your experience and hope that thins get better for you. Hijabs definitely would be useful for this purpose. Best wishes! Perfect q&a for my particular concern! I have trigeminal neuralgia and need to shield my head, neck and as much of my face from drafts and air conditioning and among all available options for head coverings, it seems hijab would fit my medical needs too. I apologise for the delay in responding. You should feel comfortable in covering or uncovering whatever works for you. Whether or not you’re religious doesn’t effect my opinion at all. I think people should be free to dress how they want. I absolutely loved it! I have been asking around people if it is offensive. I have a lot of Muslim friends and many of them are hijabi. I love the way they tie it! When I go out with them, I notice people staring and so, I decided to put on the hijab first asking my friends’ help to tie it and later learning it from internet, to experience it by standing in their shoe. Now I am all set to try out different hijab patterns. What I felt when I am in hijab at a public place is that, people tend to notice stuff that are different. And, I feel beauty is always in the things that are different and one should flaunt it instead of feeling insecure. I wear it to religious places too. My experience with hijab has been really nice so far. Hi Arpita – you are such a gorgeous soul. I’m glad that you’re having a good experience and that you’re able to enjoy it on your own way! Our school is having a World Hijab Day celebration where many of us will try the Hijab for the first time. Reading this makes me feel less nervous about offending the Muslim community (even though the event was created by a Muslim student organization). Thanks so much!! I’m glad I could help – and well done to those people organising the event and slashing through any stigma. Thank you. I have seen with my own eyes how women wearing hijab are treated. I work in large diverse, inclusive companies so the professional work place has helped tremendously with ‘demystifying ‘ Muslim practices. Outside the professional workplace is another story about the weird and disappointing reactions I have witnessed. 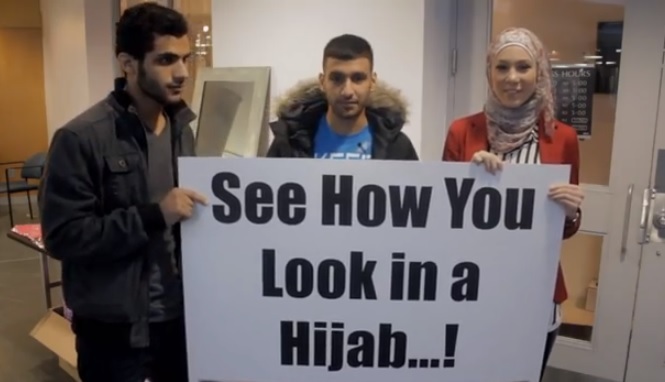 Hajib wearing “how-to” videos made by women make me want to try. The same way I want to try eyeliner, eyebrows trimming, stylish jackets, etc. Do you think a pink Hajib/scarfing with cat ears would be going too far? I think you’re absolutely right – in the work place, things seem to be fine for me (mostly) but once I’m out in the ‘real world’ people can be awfully condescending. I suppose it’s because, at work, they’re judging me on my performance where elsewhere, I am an anonymous nobody. I think deciding what’s going ‘too far’ is up to the situation you’re in and you’re discretion. I personally wouldn’t wear a hijab with cat ears around my elders, for example, because they would find it disrespectful. The pink is fine for sure but the cat ears will depend on who you’re hanging out with. Oh dear. That’s the first I’ve heard of people lashing out because someone is wearing a headscarf. In my experience, the response is usually very kind and respectful. It’s strange for people to think it’s racist. Muslim women are known for wearing headscarves in the modern era, but women from all religions and cultural backgrounds have worn headcoverings for so many different reasons. Please don’t let the responses of these misguided people influence your decision about what you will wear. It’s none of their business. I’m a non-Muslim woman who wears a hijab and I always felt confident until today when someone told me what I was doing was the same as black-face. I’m so glad that I found this post and I can’t thank you enough for writing it. That’s a ridiculous comparison. I think it’s very rare that the hijab can be culturally appropriated – and I’ve been asked this question so many times that I think that I should specifically write an article about it. Good on you for sticking to your guns, and I’m glad I could assist you. I am sorry to hear about your experience. As you would have read, I don’t support the idea of something being forced either. I hope you are able to live your life freely now. I just wanted to thank you so much for writing this, I’m very shy and wearing a head scarf or a hood makes me feel a lot less exposed and more secure when I’m out. Hijabs are beautiful but I’ve been so afraid of offending any muslim woman, it’s the last thing in the world I want. Thank you! Aw I’m so glad to hear it!! It makes me so glad to hear that you’ve found something that makes you feel secure. I’m a hijab wearing non Muslim and I love it! So much that it has changed me for the better and has increased my self esteem. I have a lot of respect for your culture and religion. Thanks for your message. I’m really glad to hear that you’ve found that sort of comfort! I am Christian and would really like to begin wearing the hijab. I love how modest they are and the idea of a visual reminder of my faith. Wearing the hijab would also allow me to experience wearing a headscarf every day before I commit myself as a nun. However I’m fourteen so I’m not sure my mother would allow it. Do you have any suggestions on how to approach this subject with my mom? I’ve had a few girls in your age group ask a similar question. They’ve all had different reasons for wanting to cover up more, but the concern has always been that their parents would not accept their choices. Having grown up with strict parents, I know that it can be scary to tell them how you feel about an issue or to do something that you think they wouldn’t like. Sometimes, though, we judge our parents prematurely. It may be that your mother would be very supportive of what you want to do. If you feel comfortable doing it, I would recommend that you talk to your mum about how you feel an explain why you feel that way. She might even have some advice for you herself 🙂 If you have any other questions, please let me know! I imagine peoples’ concerns stem from the ideas of cultural appropriation and the disrespect that accompanies it. Since hair covering is something women have done throughout history and cultures, this one all depends on reasoning. In Ghana, I am constantly asked to let hairdressers do my hair for me, many making the offer because they know me and would love to see their work on my hair – and even my fine straight hair could use that protection from the elements! In Canada, by contrast, the majority of people would take offense to seeing a white girl like me walking around with braids. I think it is great that some women do ask before doing, showing respect and that they do not want to show any disrespect. Further, it is even better that you respond with the reasons why you do not find it offensive, giving historical context in your response. That’s an interesting dilemma and one that I warn non-Muslims who wear the hijab about. Of course I can understand why people will think that you’re Muslim, but I also think it would be okay if you told people that you’re not Muslim. I think that people would be really understanding if you told them that you wear a headscarf for similar but slightly different reasons. World Hijab Day is a promotion that brings with it some controversy, and my accidentally running into a promotion of the event pushed me into facing my own limited and conflicting opinions and prejudices on the matter. Why did I feel self-conscious over the idea of dressing modestly? Why did I agree to let the young Muslim woman into my life by letting her give me a hijab makeover? Did she mean it when she said I looked “beautiful” after she had finished? Why was I anxious to look at myself in the mirror even tho part of me had just been hidden? Why didn’t the hijab look out of place or unnatural on me? Why didn’t I take it off as soon as I was out of sight? There wasn’t any chance at all that I would like hijab right? You wrote: “While wearing a hijab and experiencing what it feels like, even for a moment – many things may cross your mind. You might realise that you make look very different, but you’ll still feel like you. You’ll realise how much your looks play into your identity.” I did walk out and about. You are right that I did look very different with all my long hair hidden and just my pale white face showing. I did still feel like me… but I did feel different too. It was a chilly February day, so being covered wasn’t as foreign feeling as it could have been. For sure there was a different vibe to my day. Responses from others weren’t what they normally were. I had recently turned 25 and this was the first time in my life that I had ever went in public with an intentionally modest dress. Thanks for your comments. It’s an interesting thought (and I suppose, emotional) process which one can go through with the hijab. It sounds like trying the hijab on gave you some unique insight into who you are as a person in a way that you haven’t had the chance to before. Given the strength that comes through with your words, I feel as if this must have been a good thing for you. Do you think it gave you some insight into the motivations of women who dress differently to you – or even your own motivations?